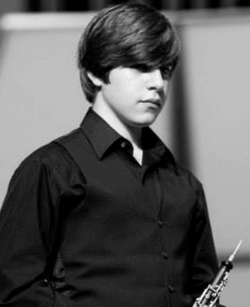 Martin Mayo is a 10th grade Oboist, attending the New World School of the Arts, High School Division. He was introduced to the oboe at Falcon Cove Middle School, Weston, Florida. Since then, Martin has participated in All-County Middle School Honor Band and All-State Middle Concert Band. He has also been granted consecutive Superior ratings from 2011 to 2014 in the annual Solo and Ensemble event of Florida Bandmasters Association. Martin has also had experience working with world renowned musicians, such as Michael Tilson, and Thomas and Nancy Ambrose King. He is currently the Principal Oboist of the Florida Youth Principal Orchestra, assistant conductor of the Miami Music Project Leaders Orchestra, and an active member of the NWSA's Symphony Orchestra and Wind Ensemble.